Mix 3-5 drops with your Clarins face care. Weakened skin? Sunburn, extreme climates, hard, salt or chlorinated water, minor cosmetic treatments*—when life takes a toll on your skin, give it a boost! Booster Repair helps sensitive skin fight back. Its unique formula is enriched with Mimosa Tenuiflora extract, a Mayan plant known for its soothing properties. 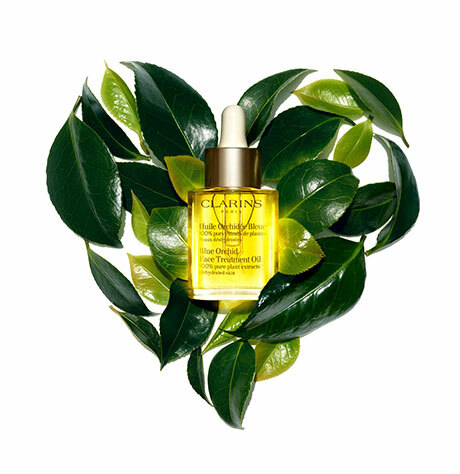 Just 3-5 drops, mixed with your Clarins face care, gets skin back on track when you need it the most. Use it for a day, a week, a month—any time your skin needs a boost. Do not use alone. Must be mixed with another face product. *Only apply to healthy skin. *Satisfaction test - 105 women - 4 weeks. Mix it in to recharge your skin. 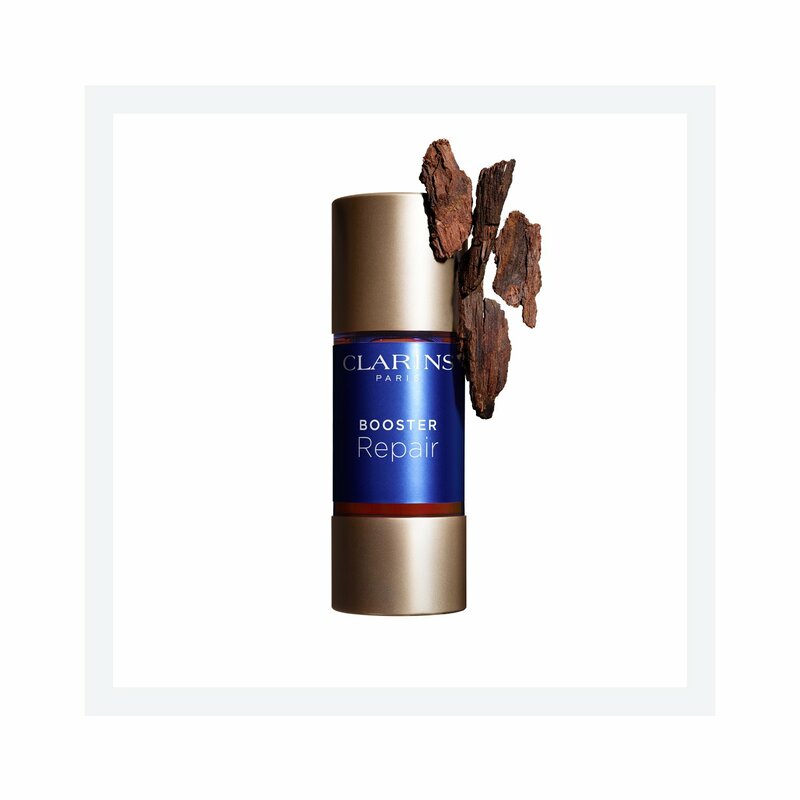 In the palm of your clean hand, blend 3 to 5 drops of Booster Repair with your Clarins moisturizer, mask, serum or foundation. Blend until smooth before applying. Use it for a day, a week, a month… anytime your skin needs a boost. WARNING: This highly concentrated formula MUST be MIXED with a face care product, following instructions for use. Do not use alone. Do not use more than the recommended amount. Rated 5 out of 5 by Jayla777 from I’m ACTUALLY Amazed Being a beauty editor, I’ve tried 1000s of products over the years. This is one of the absolute best I’ve come across. I added this to my serum and moisturizer (on separate occasions) to test the effectiveness and I swear this product has perfected my skin! I tend to pick at acne when it arises (awful, I know), and as a result get scars and blemished skin. This cleared it up, smoothed out the rough textures and (shockingly) helped even out the skin tone. Simply amazing. Well done, Clarins! Rated 5 out of 5 by Cookie5460 from Excellent booster I purchased this booster to help counter several things occurring within a week's time--stress, beach time, travel, & time zone change with hard water. I mixed it nightly with gentle day cream, for 3 nights. Beautiful radiance returned immediately. This even reduced the redness on older acne scars. Amazing! Rated 5 out of 5 by Vespa from wonderful oil! I bought all the booster oils and this is probably my favorite. I mix it with my evening lotion and can see visible lessening of my pimple marks/red irritations in the morning. The blemishes are lighter and improved. By the second or third morning the marks are usually completely repaired! I have a scar on my foot that was rippled and red, I have been mixing it with body lotion and am so blessed with the improvements I see and hope it repairs completely. If I had to pick one booster oil, this is my first pick of the booster trio. Rated 5 out of 5 by Melody11 from Glowing skin I had very dry skin with rash from sun irritation after vacations. A Clarins sales person recommended me this product. I absolutely love it! It makes my skin glow of health and smoothes it making me look much younger. Rated 4 out of 5 by ZKahn from A Good Product I received this product free for reviewing from influenster. Being someone who suffered from mild to moderate acne I have established a skincare routine that worked great. I added this to my moisturiser and used it at night after my cleansing routine. Now I don't always use a moisturiser so that meant not using this product every time. Still I did notice some change in my skin. It is more... manageable let's say. Looked healthy and not starved or dry. I feel like I need to use it for longer to see appreciable results that I can compare. So far I FEEL like my skin is getting better. Rated 4 out of 5 by Kayla0428 from Skepticalat first, but very pleased! I received this product free from Influenster for review purposes. I was a bit skeptical when I first received the Clarins Repair serum as I have very sensitive skin. We have hard water in our house, and my skin along with redness gets very dry. I was able to make my sample last a little over 4 days and am amazed at how much of a difference Ive noticed. I usually get dry skin around the sides and top of my nose, and redness right on my cheeks under my eyes. The redness is completely gone, and the dryness is almost non existent! The feel of the product is a little sticky at first but I feel that it dries pretty smooth. Rated 5 out of 5 by Chevelle from Absolutely loved my samples I recently received some samples through Influenster to try and review. I have to say I absolutely loved them. At first I was a little leary because it seemed as though it was a bit too oily for me but after it dried it felt fine. I mixed it with my normal moisturizer and fell in love after the first try. I could tell an instant difference in my skin and it did exactly what it says. My usual slight redness instantly went away. I will definitely be purchasing in the very near future and would recommend it to anyone.